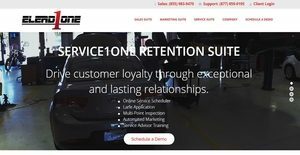 ELEAD1ONE is a customer relationship management platform designed for automotive retail industries and car dealerships of all sizes. Flexible, robust, and easy to use, the platform is ideal for automotive dealer groups, and franchised and independent dealership retailers. ELEAD1ONE aims to help automotive shops and car dealers increase their sales and maximize their profits by enabling them to provide customers with great buying experiences. ELEAD1ONE makes the process of purchasing cars and requesting services convenient and efficient by allowing customers to do it from their mobile devices. The software enables users to provide all the information that their customers need, so they will be able to buy cars that fit their lifestyle, personality, and usage preference. Furthermore, ELEAD1ONE offers data mining features, which allow users to utilize third-party data and other online resources that will help them search for sales and lease opportunities. In addition, the CRM platform helps users price their cars in ways that will provide them with a competitive advantage in the market. It also offers the capability to route leads from different communication channels, so that users will be able to apply the required follow-up for them: instant, short-term, or long-term. They will also be able to respond to their leads quickly through email, text, phone, or video. One of the most prominent features of ELEAD1ONE is the capability to instantly reach out to their customers who will most likely accept deals. These customers are those who have positive equity. This means that you can earn a profit when they sell a car they’ve leased. They are also those customers who will be able to trade in their leased car to a dealer since they can cash in their equity as a down payment for a new lease or for the purchase of a new car. Through the aid of the platform’s data mining technology, users will be able to easily identify these customers and launch service-marketing campaigns to reach out to them. In addition, this data mining technology allows users to instantly obtain information that will drive in dealership and sales opportunities. As an example, they will be able to gather information on OEM or Original Equipment Manufacturer incentives and programs. This helps them offer deals to their customers, wherein the latter can purchase cars from them at a lower or discounted price because of the incentives offered by car manufacturers. Additionally, they will be able to retain more customers, as they can individualize or personalize their service-marketing campaigns based on the data they have. ELEAD1ONE also offers an internet lead management feature that works with the platform’s car inventory tools and mobile sales app. With this feature, users will be able to send vehicle information, e-brochures, and photos to their leads and customers. They can do this quickly as the platform enables them to easily access their inventory of new and pre-owned cars. Users can also automatically send quotes to their leads. In addition, users will be able instantly to capture customer information through its mobile sales app which has the capability of scanning a driver’s license. Also, they can use this app to automatically upload vehicle information through the aid of its VIN (Vehicle Information Number) scanner. To ensure that users are informed and updated on market factors and conditions that can affect the valuation and pricing of their cars, ELEAD1ONE offers an inventory management suite. This feature allows them to view similar vehicles available in the market, and even enables them to determine how their competitors are pricing their vehicles. Therefore, they can compare their pricing with that of a competitor, and they can rank their vehicles based on their mileage, pricing, and profit levels. There are well-liked and widely used systems in each software category. But are they automatically the best fit for your enterprise’s specific requirements? A trendy software product may have thousands of customers, but does it provide what you require? For this reason, do not blindly spend on popular systems. Read at least a few ELEAD1ONE reviews and think about the factors that you desire in the software such as the price, main features, available integrations etc. Then, shortlist a few systems that fit your requirements. Check out the free trials of these products, read online reviews, get clarifications from the maker, and do your homework systematically. This exhaustive groundwork is sure to aid you find the best software application for your organization’s unique wants. How Much Does ELEAD1ONE Cost? We realize that when you make a decision to buy Customer Experience Management Software it’s important not only to see how experts evaluate it in their reviews, but also to find out if the real people and companies that buy it are actually satisfied with the product. That’s why we’ve created our behavior-based Customer Satisfaction Algorithm™ that gathers customer reviews, comments and ELEAD1ONE reviews across a wide range of social media sites. The data is then presented in an easy to digest form showing how many people had positive and negative experience with ELEAD1ONE. With that information at hand you should be equipped to make an informed buying decision that you won’t regret. What are ELEAD1ONE pricing details? What integrations are available for ELEAD1ONE? If you need more information about ELEAD1ONE or you simply have a question let us know what you need and we’ll forward your request directly to the vendor.